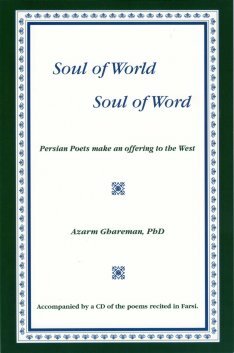 In 2003, Azarm Ghareman translated a collection of her favorite mystical Persian poems into English and accompanied the book with a CD recording of the poems in Farsi — a language unfamiliar to most Americans. Soul of World, Soul of Word is a personal invocation of the author with her cultural heritage. It is also a wonderful addition to anyone’s collection who loves mystical poetry, meditation, and healing of the world through the power of language. A tear lives but once. It is born in the Heart. It rolls down to nurture the arid Soul. are buried in our smiles.